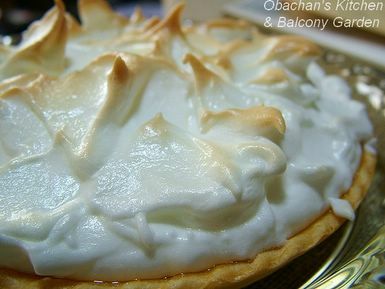 Obachan's Kitchen & Balcony Garden: Hey, What Do You Think about My Very First Lemon Meringue Pie? Hey, What Do You Think about My Very First Lemon Meringue Pie? Yes! I gave this a try this afternoon to use up the lemon curd that I made the other day. My very first lemon meringue pie! What do you think? *ahem* Sorry. It's really delicious loking. I did like the taste. Thank you all who gave me the idea. It was so good with a nice cup of tea. Mmmm.. you have a good imagination. Your pie looks great. Around here, a lot of diners pile the meringue amazingly high, so that the pie is nearly smothered under the topping.